This is the first time during the entire trip that I’m conscious that it is a weekend. Usually everyday jumbles up together since I do not have a routine separating the weekdays from the weekends. Today, I planned to finish at least 2 days of revision in the morning. Sadly, I had to deal with printing my documents for the US visa application and that took up half of the morning. I spent another half of the morning reading up on Veelas in the Harry Potter world (I’m now at GoF!) which led to more useless web surfing. 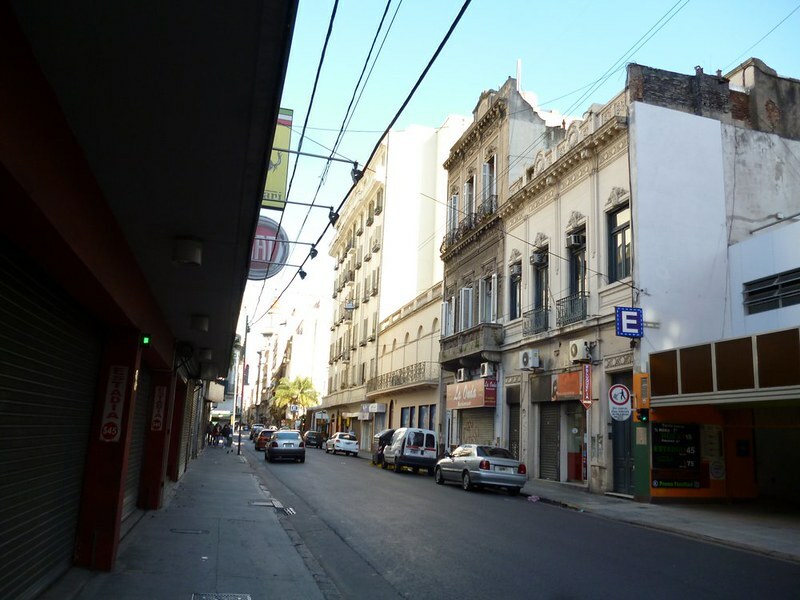 In the morning, I also booked ferry tickets to Colonia del Scaramento, Uruguay, for my very first visa run. Wait, YQ, you can’t just drop new vocabulary like that into your post and expect us to Google it.That’s just lazy. OK OK, I’ll explain. Long term travellers do visa run to extend the length of their visa. 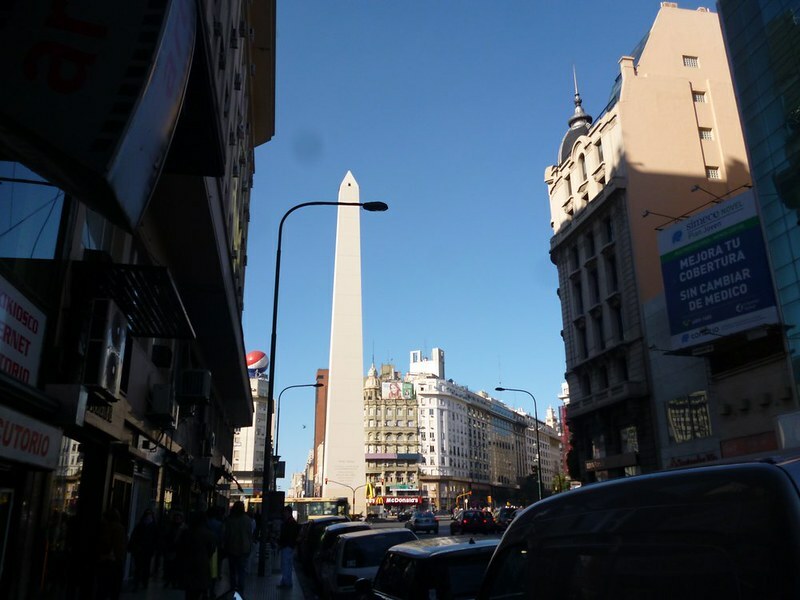 The do this visiting another country and coming back to the country of their choice in a short period of time. That 30 day deadline is coming up in 2 week’s time and I will become an illegal alien if I overstay. However, since I’m applying for a US visa, I suspect that my passport would be kept with the US embassy for at least a week since next Thursday and Friday are public holidays. If I have terrible luck, I might even overstay. 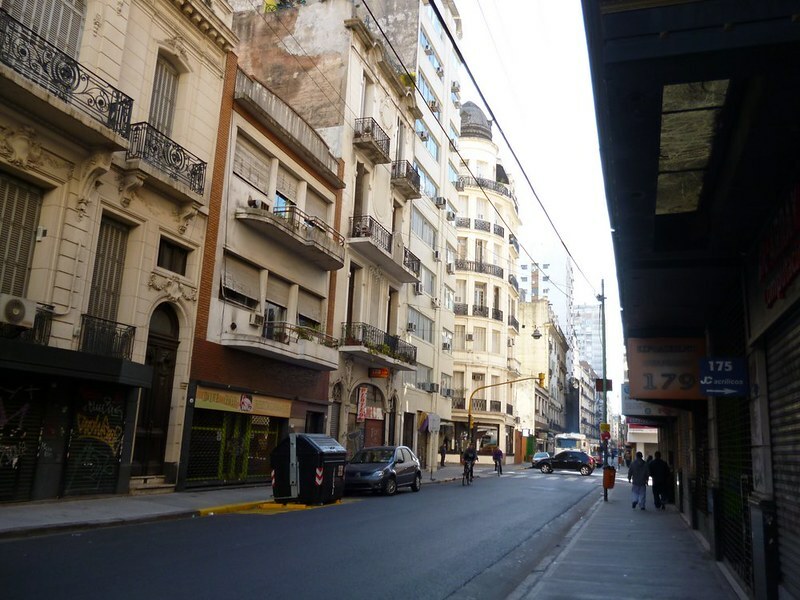 So to extend my visa, I will visit Uruguay. 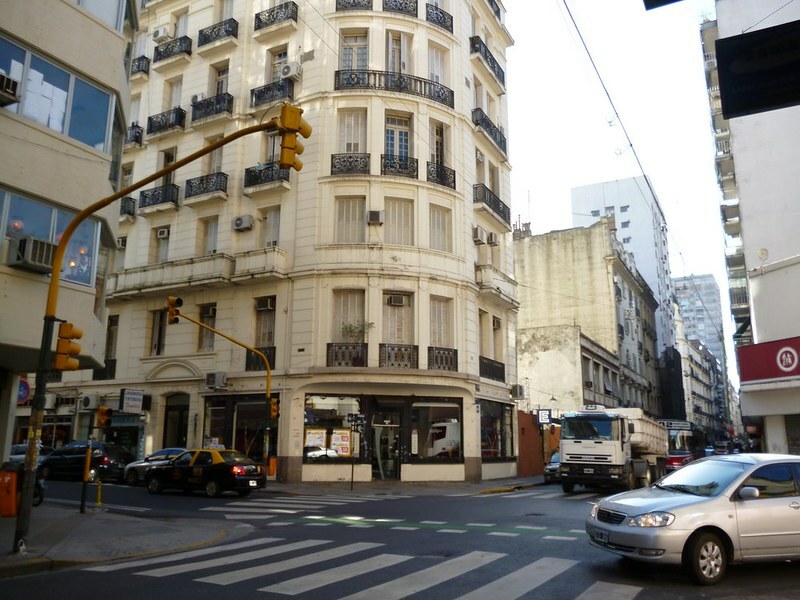 I will get an exit stamp at the Argentine side and a new entry stamp when I come back in the evening. 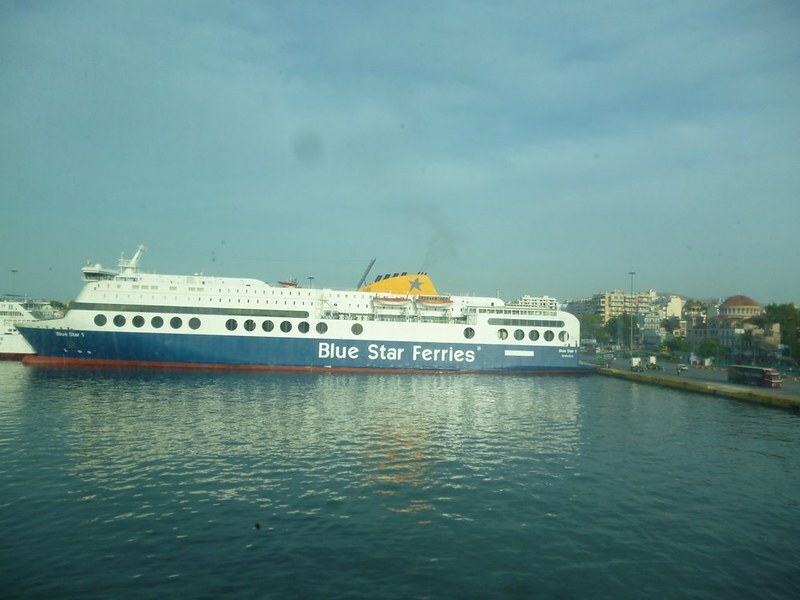 Thankfully my visa run is just a ferry ride away. I’ve read horror stories such as Juno from Runaway Juno who had to do a 573km visa run. After concluding my affairs of the morning, I decided to take a walk and visit the second hand book stores my teacher told us about. 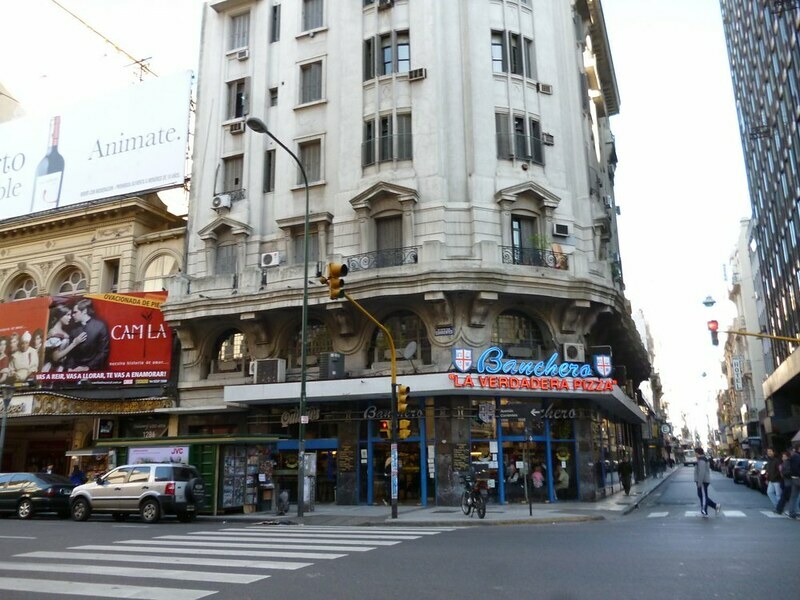 Luckily, Ave Corrientes, where the bookshops are, is very near the hostel. I only had to walk about 3 blocks to get there. 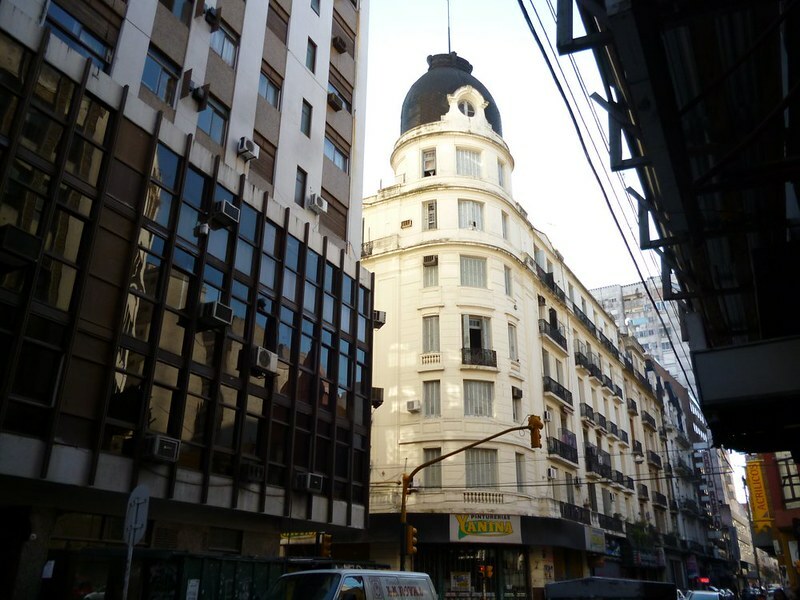 Along the way, I snapped a few photos so you can see how Buenos Aires looks like. 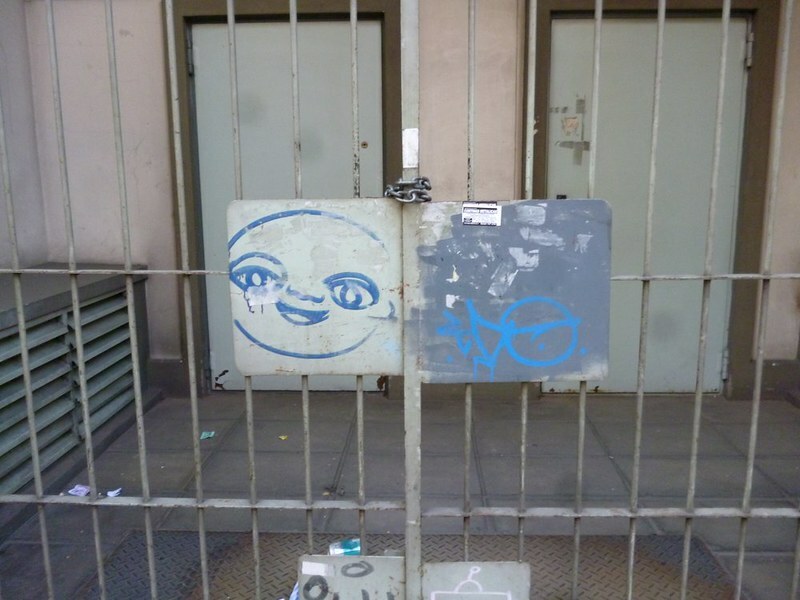 Vandalism or smiley street art? 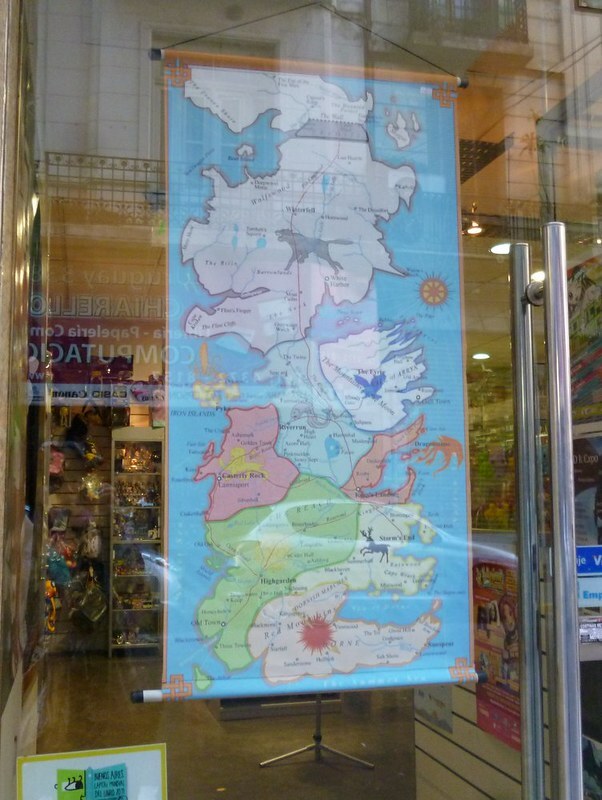 I spotted this map of Westeros but I do not think the story universe actually looks this neat. I browsed through one of the second hand bookstores. It didn’t look like the usual second hand bookstores crammed with books from top to bottom shelf. Instead, the books were arranged in stacks on tables. There were a lot of interesting books around. I was tempted to get a Book of Myths for Children which had Greek legends but 22 pesos wasn’t something I wanted to spare. At last, I found a Sweet Valley Twin book. I’m more attached to the Sweet Valley High series but that book was only 3 pesos so I bought it. At the cashier, I made a language mistake by saying, “Good.” when the cashier said, “Good day.” The other person at the cash register was unkind and asked his friend repeatedly if he asked “Good day” and laughed. Alas, I do not know that much Spanish. 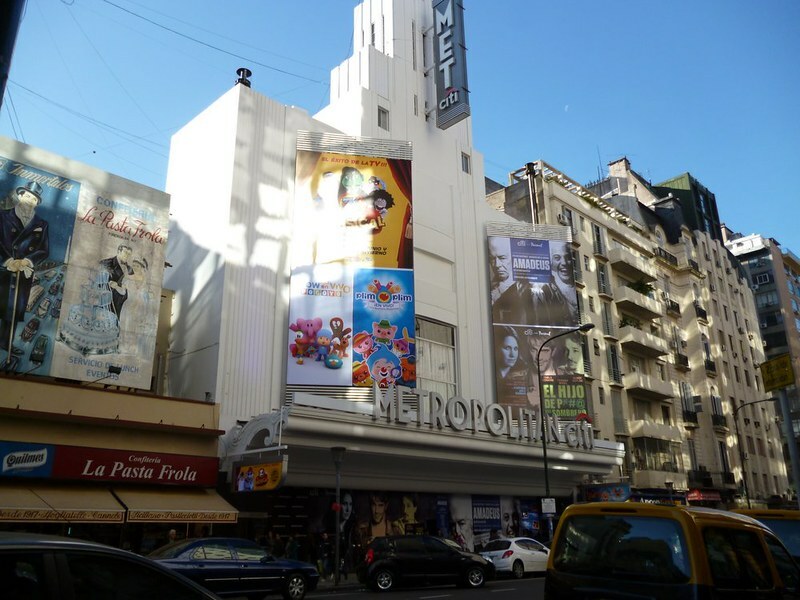 Enough complaining, let’s get back to sightseeing Buenos Aires. 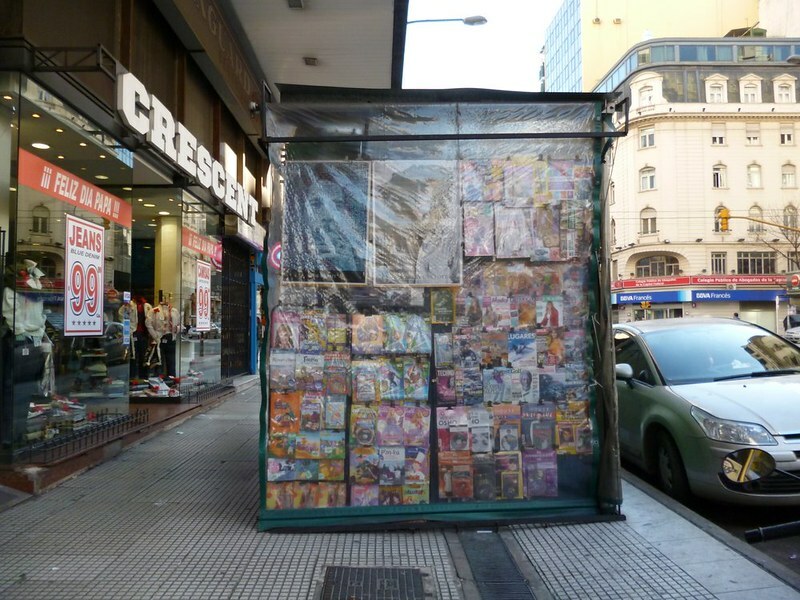 Newstand. I’m very scandalized that they display X-rated books publicly here. Mostly they have covers of half naked women with large breasts. 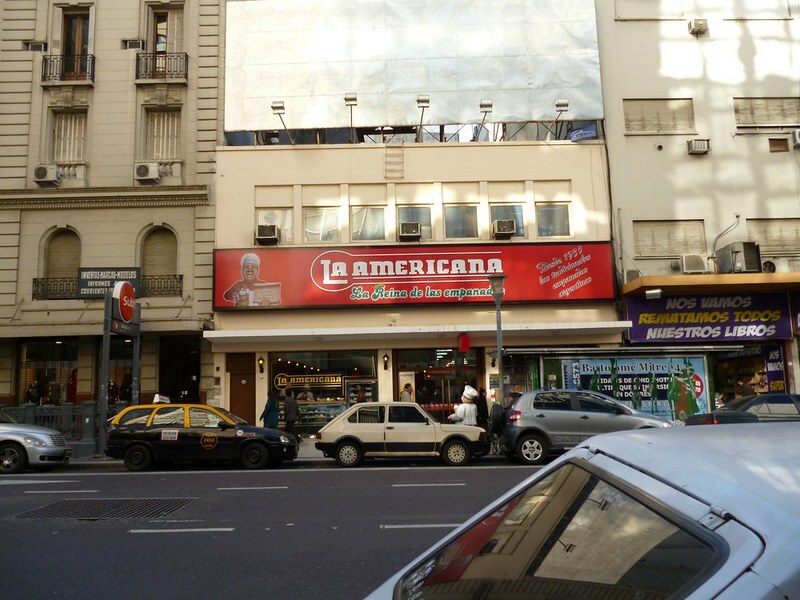 La Americana, an empanada place. 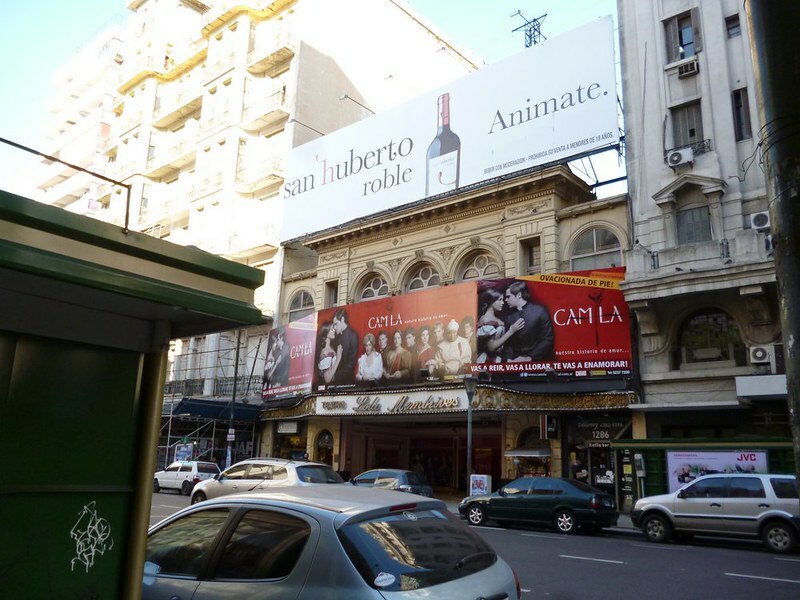 From the poster, Camila looks like a scandalously good show. 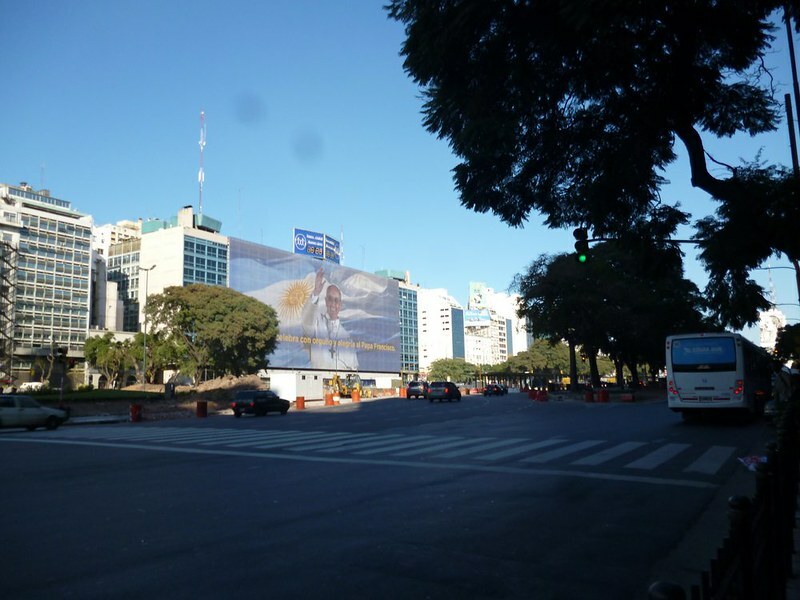 See that big poster of an Argentinine flag and the pope? It’s from the city, to celebrate Papa Francesco’s new job. Dinner was another nice meal of home cooked steak with mushrooms. It’s strange that the mushrooms were more expensive than my two rather large pieces of beef.